Apple employees will finish moving into the new campus by the end of the year. Apple officially officially unveiled the new Steve Jobs Theater at its campus in Cupertino, California, today, and a familiar voice greeted the audience as the company's highly-anticipated product event started. "One of the ways that I believe that people express their appreciation to the rest of humanity is to make something wonderful and put it out." That was none other than the late Steve Jobs. (Marcio Jose Sanchez/AP) Apple CEO Tim Cook kicks off the event for a new product announcement at the Steve Jobs Theater on the new Apple campus, Sept. 12, 2017, in Cupertino, Calif.
Apple CEO Tim Cook remarked at the top of the event that "it's only fitting that Steve should open this theater." 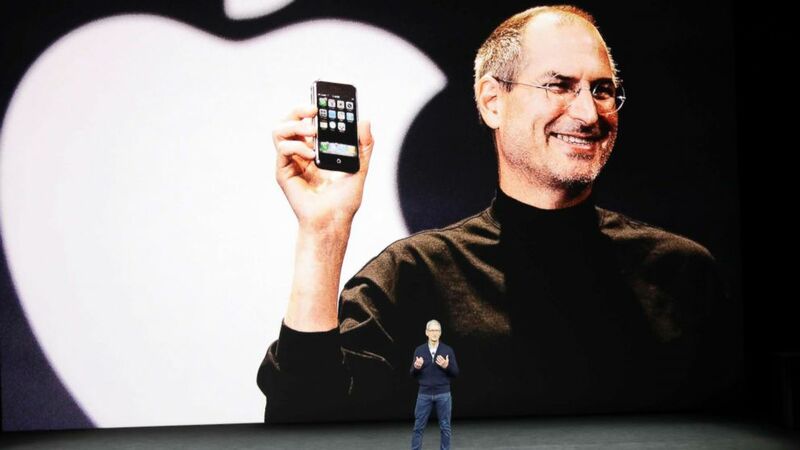 "Steve’s spirit and timeless philosophy on life will always be the DNA of Apple," Cook said. The theater sits on top of a hill, overlooking the main building and surrounding meadows. "Steve’s vision and passion lives on here at Apple Park," Cook said. 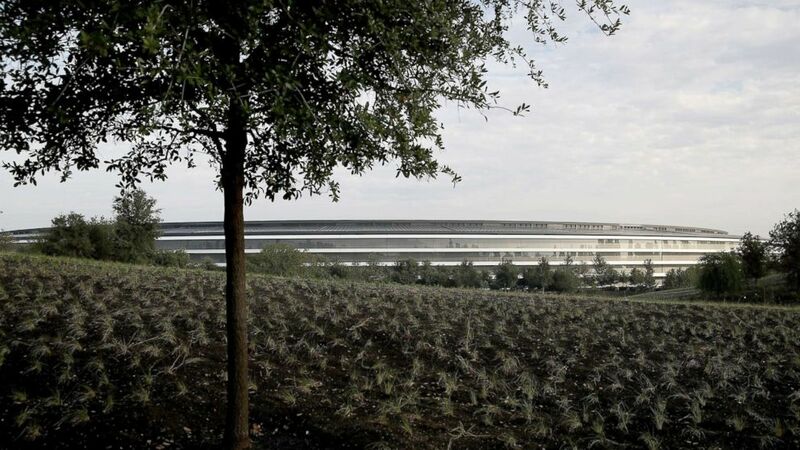 The tech giant's new 175-acre campus, officially called Apple Park, was dubbed the “spaceship campus” by outsiders because of its similarity to a flying saucer, complete with the minimalistic and simple designs that Apple is known for. The ring-shaped building boasts 2.8 million-square-feet of space and the world’s largest panels of curved glass. The park replaces a massive field of asphalt and concrete and is now a campus of lush greenery. Cook said all of the company's 12,000 employees will be working on site by the end of the year. (Justin Sullivan/Getty Images) A view of Apple Park, Sept. 12, 2017, in Cupertino, Calif. The campus includes an outdoor area for employees, and two miles of walking paths, an orchard, meadow and a pond. The employees will also have access to a 100,000-square-foot gym. Apple said that the campus is powered by 100 percent renewable energy, as part of its commitment to the environment and sustainability, and has one of the largest on-site solar installations. The building is also the world’s largest naturally ventilated building, projected to require no heating or air conditioning for nine months of the year, according to the Apple website. The campus will open its doors to outsiders with a visitor center, which opens later this year. There will be an informational area to teach visitors about the building, as well as an Apple store and a café. British architect firm Foster + Partners, the team behind the design of Apple's stores, spearheaded the look of the new campus. Apple Park is one of the most energy efficient buildings in the world, the company said.